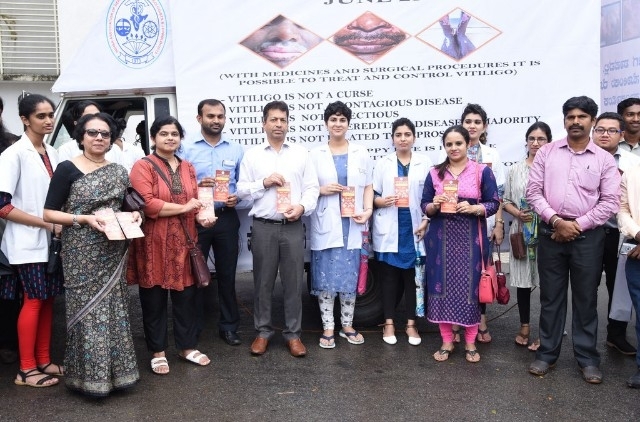 Manipal : Vitiligo Ratha (Thonnu Ratha) for Vitiligo Awareness Campaign was jointly flagged off at Manipal by Dr Padmaraj Hegde Dy Medical Superintendent and Dr. Shruthakeerti Shenoy Professor and Unit Head, Dept of Dermatotlogy - Kasturba Hospital Manipal flagged off the Vitiligo Ratha (Thonnu Ratha) from the Main Gate of Kasturba Hospital Manipal. Dr Padmaraj Hegde also released the information brochure on Vitiligo on the occasion. Speaking on the occasion Dr Shruthakeerti Shenoy said “Vitiligo is a non-life-threatening skin-related problem which presents as white patches on the skin”. Vitiligo Ratha (Thonnu Ratha) would travel all across all district of Karnataka to raise awareness and eliminate any myths or disinformation among general public about vitiligo. 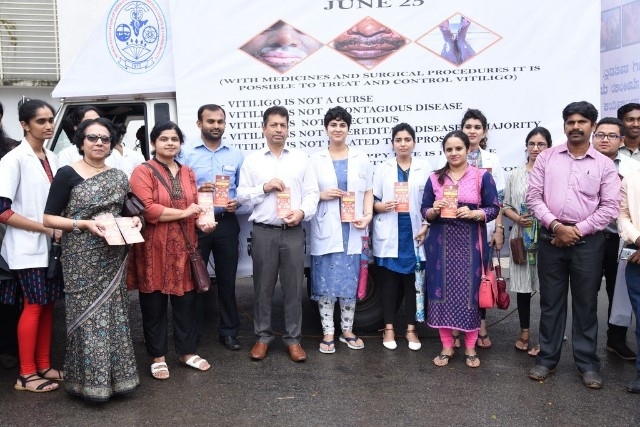 This was the initiative of Karnataka branch of Indian Association of Dermatologists, Venereologists & Leprologists (IADVL KN) who started the Vitiligo information awareness campaign on the World Vitiligo Day on June 25. Kasturba Hospital was privileged to support this initiative. “Vitiligo is a non contagious skin condition which does not cause any serious damage to the patient and its just a change in color of the skin, Dr Smitha Prabhu Associate Professor Dept of Dermatology added. Dr Varsha Shetty Asst Prof Dept of Dermatology coordinated the Tonnu Ratha Flagoff program.